Ghana is a former British colony and probably is well known around the world as the ‘Gold Coast.’ The country is full of natural resources and is famous for its gold deposits and oil reserves. Ghana’s national football club is lovingly called the "indomitable lion" because of their amazing performance on the worldwide stage. There are more than 100,000 Ghanaians living in the USA and many of them have friends and loved ones back home. Ghanaians are known for their strong family ties, which means they place a priority on remaining in touch with friends and family at all times. simplecall understands this and that is why we offer one of the most affordable services to call Ghana. Our low rates will make sure that you can keep talking for as long as you want. If you have been trying international calling cards and have realised that you have been blindsided by hidden fees and aren’t getting all the minutes you purchased then you should definitely give simplecall a try. Our cheap rates to Ghana start from 40.76¢ /min for landlines and mobiles. 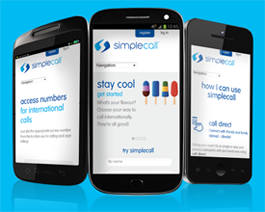 To use our PINless international calling card, just visit our website www.simplecall.com and register. We will make sure that you enjoy a hassle-free, low rate and high quality service.